"Ottolenghi is a genius with vegetables-it's possible that no other chef has devised so many clever ways to cook them." "Yotam Ottolenghi is the most creative but also practical cook of this new culinary era-a 21st-century Escoffier. If I had a four-star rating for cookbooks, I would give Plenty More five stars." "Chef Yotam Ottolenghi outdoes himself with the follow-up to his famed book Plenty. Expect even bigger, bolder meatless recipes." "Yotam Ottolenghi adds luscious notes to the vegetarian flavor spectrum in Plenty More." "Chef Yotam Ottolenghi's Plenty More is a delicious ode to grains, legumes, and fresh vegetables." "A new wave of Ottolenghi fever (and fervor) is about to hit and, thank goodness, there's no cure. I suggest you simply give in to it, replenish your spice pantry, gather your vegetables, grains and legumes, and celebrate big-time." "This smart chef knows flavor"
Plenty More is even better than the original, fresh with the flavors and ingredients of Ottolenghi's most recent travels and readings. There are still many traces of his Middle Eastern influence, but now he's incorporated touches of Southeast Asia, India, New York, and Britain. Who pairs chanterelle mushrooms, black glutinous rice, tarragon, and goat cheese, and does so with aplomb? Only Ottolenghi. Even if you've already amassed a library of his books, you'll learn something new from Plenty More. --Bon Appetit "Ottolenghi is a genius with vegetables--it's possible that no other chef has devised so many clever ways to cook them." --Food & Wine "Yotam Ottolenghi is the most creative but also practical cook of this new culinary era--a 21st-century Escoffier. If I had a four-star rating for cookbooks, I would give Plenty More five stars." 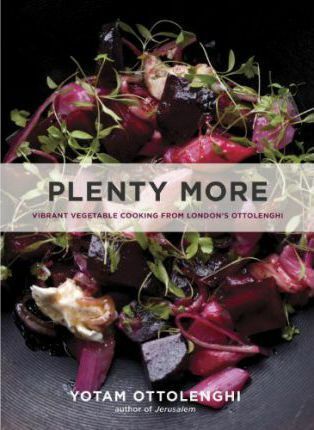 --Wall Street Journal "Chef Yotam Ottolenghi outdoes himself with the follow-up to his famed book Plenty. Expect even bigger, bolder meatless recipes." --Good Housekeeping "Yotam Ottolenghi adds luscious notes to the vegetarian flavor spectrum in Plenty More." --Vogue "Chef Yotam Ottolenghi's Plenty More is a delicious ode to grains, legumes, and fresh vegetables." --Self Magazine "A new wave of Ottolenghi fever (and fervor) is about to hit and, thank goodness, there's no cure. I suggest you simply give in to it, replenish your spice pantry, gather your vegetables, grains and legumes, and celebrate big-time." --BookPage "This smart chef knows flavor"
--Dr. Oz: The Good Life Plenty More is even better than the original, fresh with the flavors and ingredients of Ottolenghi's most recent travels and readings. There are still many traces of his Middle Eastern influence, but now he's incorporated touches of Southeast Asia, India, New York, and Britain. Who pairs chanterelle mushrooms, black glutinous rice, tarragon, and goat cheese, and does so with aplomb? Only Ottolenghi. Even if you've already amassed a library of his books, you'll learn something new from Plenty More. Yotam Ottolenghi is the author of Plenty and Sweet, co-author with Ramael Scully of NOPI, and co-author with Sami Tamimi of Ottolenghi and Jerusalem, which was awarded Cookbook of the Year by the International Association of Culinary Professionals, and Best International Cookbook by the James Beard Foundation. All five books were New York Times bestsellers. He lives in London, where he owns an eponymous group of restaurants and a high-end restaurant, Nopi.